Can castol oil safely induce labor at home in postdate women? Pregnancy that extends beyond 40 weeks gestation is termed a post-date pregnancy. There are many maternal and neonatal complications that arise from post-date pregnancies, such as cesarean section, fetal distress, or even intrauterine fetal demise. There are many modalities utilized for the induction of labor in postdate pregnancies. Castor oil is a derivative of the seeds of the Ricinus Communis plant that has been used for hundreds of years by lay midwives as an agent for the induction of labor. Recently, there have been several research studies showing its effectiveness in inducing labor in uncomplicated, singleton pregnancies, in the inpatient hospital setting. However, the effectiveness of castor oil for induction of labor in post-date pregnancies in an outpatient setting has not been studied in a randomized placebo controlled trial. Therefore, we chose to study the efficacy and safety of castor oil as an agent to induce labor in low-risk women with post-date pregnancies specifically in the outpatient setting. Fig. 1. Cumulative rate of spontaneous onset of labor adjusted for age, among primiparous and multiparous women, by intervention group. Eighty-two women with a low-risk post-date singleton pregnancy with an unfavorable cervix, without effective uterine contractions were randomized to the study, 38 were randomly assigned to the intervention (castor oil), and 44 were randomly assigned to the control (sunflower oil). Sunflower oil was chosen as the placebo as it is quite similar to castor oil in terms of color, taste and consistency. The primary outcome was proportion of women entering the active phase of labor 24, 36, 48 hours after ingestion of the oil. Secondary outcomes included rate of maternal and fetal complications. Participants were given 60 mL of the oil admixed with orange juice and were monitored for side effects. Women were instructed to return to the delivery room if they experienced regular contractions, ruptured membranes, decreased fetal movements, vaginal bleeding, or after 24 h from drinking the oil in the absence of any of the aforementioned events. Participants were seen once daily until delivery or until gestational week 42. Those women who reached 42+0 weeks gestation without the onset of active labor were referred to the delivery room for a formal induction of labor per standard clinical protocol. Both groups were comparable with regard to demographic and obstetric parameters except for the women in the castor oil group were significantly older (mean age was 29.0 vs. 26.1). No significant difference was found between the intervention and the control group in percentage of women who entered active labor within 24, 36 and 48 hours. 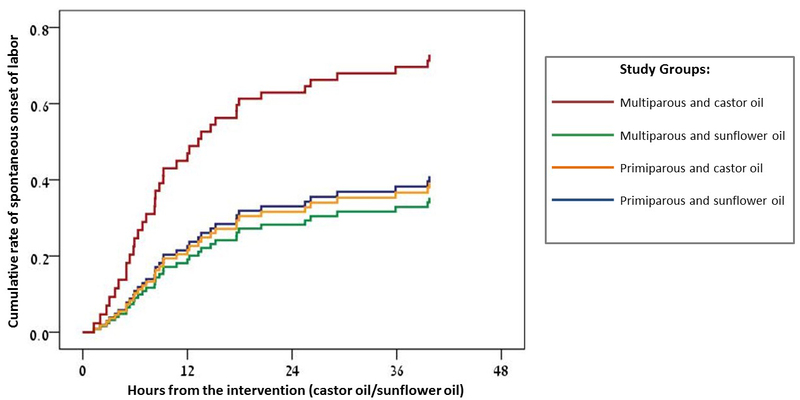 In the castor oil group 42.1% entered labor within 24 h, 50.0% within 36 h and 52.6% within 48 h compared with 34.9%, 37.2% and 39.5% in the sunflower oil group respectively, but showed a trend favoring the castor oil. However, when analyzed according to parity (having a prior birth), there was a significant beneficial effect on entering active labor within 24, 36 and 48 hour after castor oil ingestion compared with the placebo in multiparous women (having had prior births). The cumulative rate of spontaneous onset of labor among multiparous women in the castor oil group was higher at all three time-points. This effect was not significant among primiparous women (first delivery). No differences between the groups in rate of obstetric complications or adverse neonatal outcomes were noted. This study showed that castor oil is a natural, low cost, and effective agent to induce labor, in post-date, low risk multiparous women, in an outpatient setting, without hospitalization or monitoring, during the latent phase of labor. Safe induction of labor in the outpatient setting can lower health care expenditure while increasing patient satisfaction with the birthing process. Castor oil for induction of labor in post-date pregnancies: A randomized controlled trial.